The physiologies of bonsai trees are of that of any other trees. They are, in essence, outdoor organisms that have evolved to be accustomed to the raw elements of nature. As bonsai cultivators, we do our best to replicate the natural conditions that are best suited for a particular bonsai tree. To put it simply, bonsai trees grow best in the outdoors as they are exposed to their natural environment. Nevertheless, there are many bonsai enthusiasts who have refined the skill of keeping bonsai indoors. Generally, there are no species of trees that are known to flourish better indoors than outdoors. Unless you are able to replicate its natural conditions indoors, unfortunately most bonsai trees will eventually die when kept indoors unless you give them the opportunity of a few odd days in the fresh open air or the bonsai adapts....the ideal temperature for and indoor bonsai is 18-25 C, fortunately in our region this is the temperature that is fairly constant all year round. So, with some TLC and 'reading-up' a bit about bonsai, you may well have a partner for life. If you plan to keep your bonsais indoors, you will have to select the right breed of tree based on the tree species and the weather condition in your region. 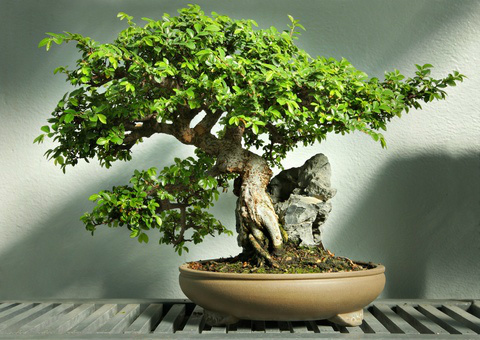 If you live in an area with extreme weather conditions (such as scorching heat and icy cold nights), it may be best to keep your bonsai indoors and most bonsai tree species suitable are from tropical and temperate climates such as Ficus, Ligustrum, Carmona, Ulmus(Chinese Elm), Durantha and others (check the web for 'suitable tropical bonsai trees'). For those who have just got started in this hobby, it is best to select a tropical tree species if they are planning to keep it indoors. Tropical bonsai trees are relatively easy to maintain and will grow well indoors given the right condition.